The 17th Shanghai International Children Baby and Maternity Products Industry Expo (CBME China 2017) opens its doors to domestic and international buyers today and will run until 21st at the National Exhibition and Convention Center (NECC) in Shanghai, China. Nielson's latest survey shows that for the first quarter of 2017, consumer confidence is the highest in the past two years. Consumers, now with higher per capita income, demand better products and services. At the same time, China's baby products industry develops and evolves to address changing consumer needs and remain competitive and profitable. The industry is quickly coming up with new products and services to address the changing trends. CBME China 2017 highlights these trends, new ideas and products with the launch of its specialized zones and activities. 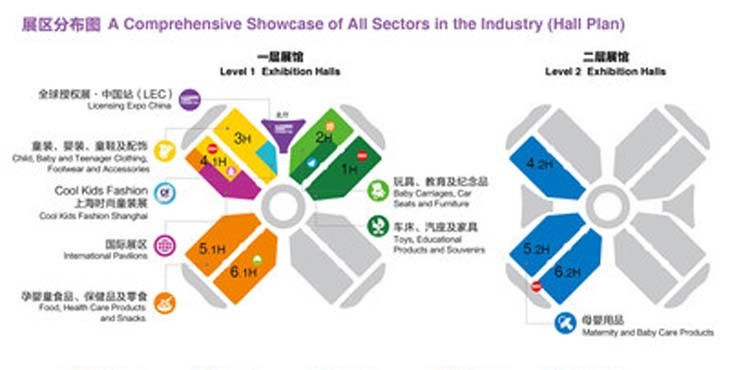 The event features 2,662 local and international exhibitors (12.51% YOY) showcasing 3,952 brands (7.6% YOY) in an expanded 239,732sqm (7.36% YOY) exhibition space. • CBME China 2017 is the one-stop trade fair for children, baby and maternity products and services from all over the globe, covering maternity and baby care products; baby carriages, car seats and furniture; food, health care products and snacks; maternity clothing, underwear and accessories; children, baby and teenage clothing, footwear & accessories; toys, educational products and souvenirs, services and more. • New zones with broadened product coverage in 2017 to address shifting consumer needs: Fine Food Zone, Fabulous Mom Zone, Play & Learn Zone and Outdoor Recreation and Sports Zone to feature new brands, products and services. These products include non-traditional products like eggs, fresh produce, gluten-free product; prenatal and postpartum care products and services, early education in form of play, music and movement programs, photography services and more. • The fair features 10 international and regional pavilions from Australia, France, Hong Kong, Japan, Korea, North America, Singapore, Spain, Taiwan, and United Kingdom. CBME China not only helps more international brands enter mainland China, but also provides consumers with more product and brand options and variety. • Co-located with CBME China: Cool Kids Fashion Shanghai 2017 opens with 95+ kids fashion brands from 16 countries and regions. Event highlights include Kids Fashion Design Contest/Gallery, Trend Forums, Kids Fashion Shows and more. • CBME Product Design Contest 2017 provides aspiring inventors and designers a venue to showcase their designs and find potential partners to bring their works from the drawing board to production. • Kids Fashion Design Contest 2017 aims to bring kids fashion design and aspiring designers to the spotlight. Designs are on display the "Kids Design Contest Gallery", followed by Fashion show and announcement of winners. • As the industry's most anticipated awards, CBME AWARDS 2017 brings renowned experts, industry leaders and media together. Short-listed entries are on display at the CBME AWARDS Gallery. • CBME China recognizes design excellence, creativity, innovation and safety, CBME Innovative Product Awards Gallery showcases 64 finalists. CBME China 2017 continues to boost the industry through education, training and customized activities to enhance profitability. • CBME China Industry Seminars takes on the theme "Sustainable Profitability is the New Gold." 22 industry experts will discuss the trends affecting China's changing baby products market and industry, consumer behavior changes, best practices for e-commerce, staff retention, new strategies for traditional retailers, retail store operation optimization and more. • A series of business matching sessions have been organized with local and international visitors including retailers, distributors, e-commerce companies, supermarkets/ hypermarkets, department stores, commercial real estate, and more will be made. Participating companies include Baodaxiang Teenage Children Shopping Center, Beibei.com, Canada Infantmax, Dangdang.com, Hankyu, Hanshion Department Stores, HMCK Baby, Jd.Com, Joybaby Overseas, Kidswant, Little One Baby And Toys Shop, Mia.com, Nishimatsuya Chain, Parkson, PT TNP International, RT-Mart, Suning Redbaby, Tmall mother & baby, Vigor Life International, Windeln.de se, Wu-Mart,Yhd.com, and more. Keeping to the theme: "Focusing on now, leading to the future," CBME China 2017 will join hands with industry stakeholders to lead and serve the industry.